We Live In A Political World: #316 / Do U? 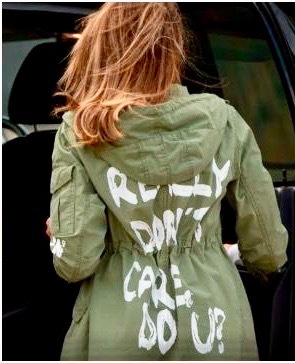 On June 23, 2018, India Today ran an article that focused on the criticism of Melania Trump that followed her appearance in public wearing a Zara jacket with the following words painted on the back: "I really don't care, do u?" That's where I got this picture. The First Lady chose to wear this particular jacket on her way to a detention center in Texas, set up for migrant children separated from their parents. It seemed like a gratuitous insult. Just yesterday, in another gratuitous insult, the president blamed California's "gross mismanagement of the forests" for the two major wildfires now blazing in the state, one of which is the deadliest wildfire in the state's history. 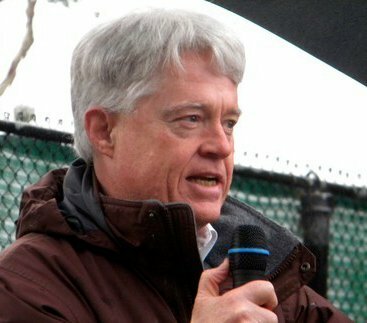 We need, of course, to "care" about the world, and everything in it, but maybe we should "care less" about what the president and his family do and say. 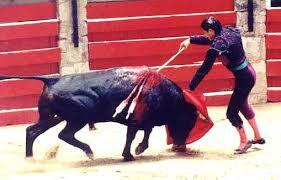 I was in Spain once, and saw a bullfight. If you were the bull, "not caring" about that irritating red cape could be the route to a different kind of life. Do you remember that story about Ferdinand? Think about it! We don't have to charge to our death every time some member of the Trump family, including the president, waves a blood-red rag in our face. 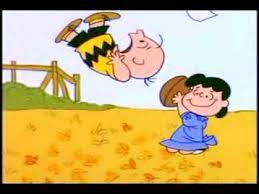 We don't, actually, really have to try, one more time, every time, to kick that stupid ball that the president keeps tempting us to kick!